Serve City Serves is our organization's exciting community outreach program that aligns closely with our three-pronged motto of Excellence, Relationships and Love. Serve City Serves provides young athletes on our club volleyball teams the opportunity to help those less fortunate by giving back to the local community or to national or international causes, an important new tool in our mission to train our athletes to reach their highest potential both on and off the court. Players grow in life skills and character as they perform community service that impacts their hearts, minds and values. 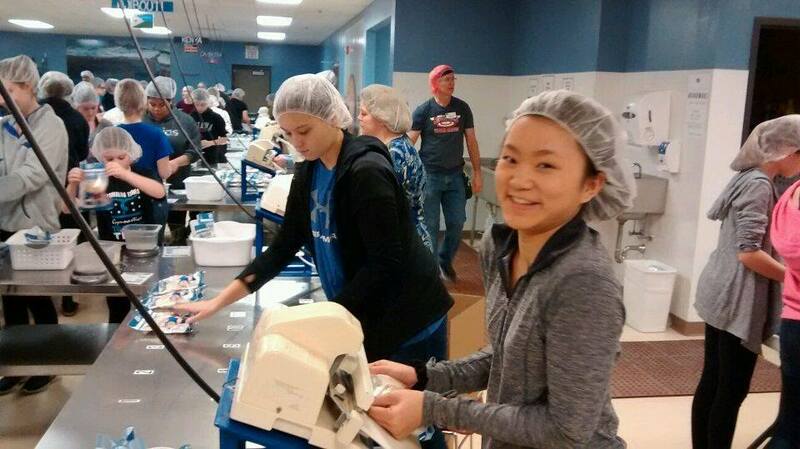 Our Elgin and Des Plaines teams packed nearly 15,000 meals at the Feed My Starving Children facility in Schaumburg. These meals fed 40 malnourished kids for a year in the African nation of Malawi. Feed My Starving Children is an international nonprofit that supplies nutritionally complete meals specifically formulated for malnourished kids. All our athletes did random acts of kindness, from writing thank-you letters to teachers and military personnel to sharing encouraging notes with schoolmates, through our Raise Craze fundraising program. For more information, contact jsmith@servecityvolleyball.org or call (630) 456-1717.